Awaiting a consistent dry spell for concrete pouring lies a hole in the front left corner of the Armory lawn in Marietta. “I need at least a day and a half of clear, dry weather for pouring and setting,” said Safety-Service Director Jonathan Hupp. But it’s not just a concrete pad that’s going in the spot where the GoBus stops four to six times per day, it’s the future location of a small shelter for bus riders. It’s a simple windowed design to protect travelers from rain and wind while allowing the enjoyment of spring through fall weather. When facing the Armory from the street, it will be on the left corner of the lawn. Oxender said to tie the 6-foot-by-12-foot structure into the feel of the downtown street she is working with Marietta Main Street on surrounding additions. “I think the offer from Marietta Main Street to fund decorative planters on either side of the shelter will enhance the area,” she said. Charlie Clay, owner of Dad’s Primitive Workbench, across the street from the Armory and post office, said he has seen the GoBus used when he walks down Front Street, especially on Cash Mob Mondays on the first Monday of each month. He said he just hopes the shelter complements the historic nature of the downtown. “The (mock-up) is basic, it doesn’t scream city, but adding planters would look nice,” he added. According to Claudia Bashaw, GoBus manager for the Hocking Athens Perry Community Action, the bus is used more by those visiting Marietta than departing from the area. Often those patrons are arriving to utilize the low-cost transportation option during council committee meetings or on the weekends for day trips to Columbus or Cleveland. To see bus stop times and book a ticket on the GoBus, visit ridegobus.com. 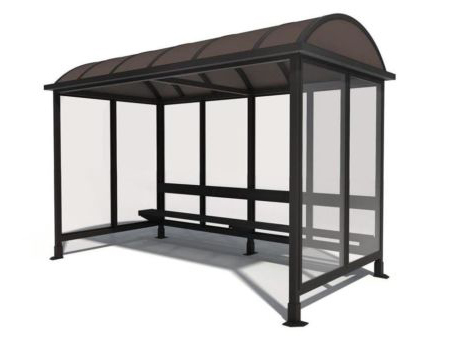 ¯ A 6-foot by 12-foot barrel roof shelter is to be installed in the front left corner (from the street) of the Armory lawn in Marietta in the coming weeks at the GoBus stop. ¯ The structure and concrete will be funded through GoBus, at no cost to the city.